This one-bedroom condominium is located just steps from the ocean. We have new wood floors throughout the unit and a newly renovated kitchen and bathroom and will make it seem as though you are at home. It has a beautiful views of Ma'alaea Bay, Mount Haleakala, Molikini, and Kaho'olawe Island from the second-floor lanai. Listen to the sounds of the ocean or watch the whales in Ma'alaea Bay. The condominium is nestled in secluded Ma'alaea between the small boat harbor and Ma'alaea Beach. The beautiful, crescent-shaped beach is excellent for strolling, jogging, or sunbathing and it has beautiful, panoramic views with no crowds. Ma'alaea is centrally located on the island between Kihei and Lahaina. There are 19 golf courses located within 15 minutes of the condominium. The Maui Aquarium, restaurants, shops, and boat harbor are a three-minute walk from the condominium. Relax and enjoy the beauty of Maui. Dawn and Dean Theodore are pleased to welcome you to their home in Maui. Dawn was a flight attendant for United Airlines for 34 years as well as owning her own dance studio for 25 years and being a psychotherapist for the past 20 years specializing in the treatment of eating disorders. Dawn is an international speaker and the author of the book " TuTu Thin" A Guide to dancing without an Eating Disorder. Dawn teaches Master Classes of dance across the US at different dance studios. Dean was an occupational therapist who worked with children with developmental delays. He is a designer and also specializes in non anesthetic teeth cleaning for dogs and cats. Dean is on the board for an animal rescue organization, START. They are frequent visitors to their condo in Maui and love to boogie board and paddle board. We fell in love with the great ocean view. You could not be closer to the ocean unless you were on it in a boat. I love hearing the waves crash all day from the lanai. 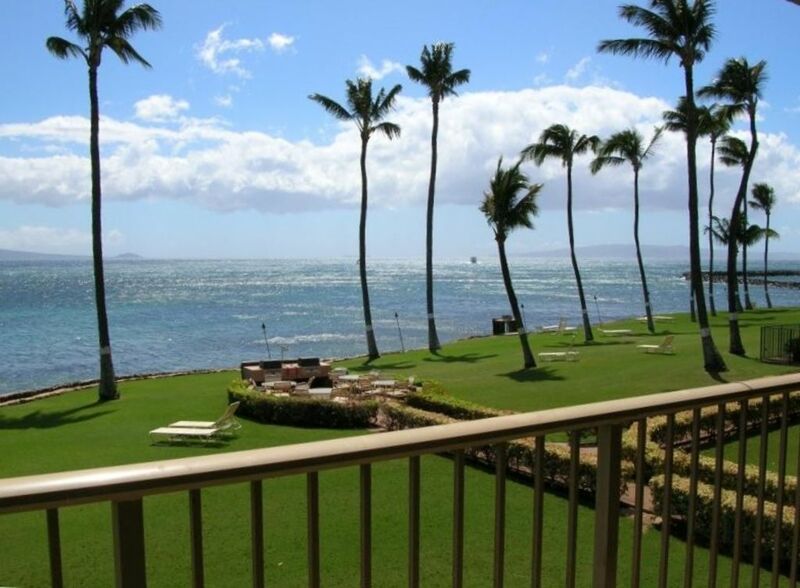 The condo is centrally located to all the activities on Maui. Great ocean breezes. Beach is a 3 minute walk and goes for 10 miles to Kihei. Great beach for swimming, running or walking. Unit is oceanfront with an unobstructed view! Located on the same floor.... Not in the unit. What a wonderful vacation in a magical area of Maui. I would recommend this condo to anyone. This condo met all of our expectations. It was nicely updated throughout, from the kitchen to the new living room furniture. The location was perfect it is easy to get to all parts of the island. The views from the condo of the ocean were amazing. The property grounds are immaculately maintained. Contact with the owner was seamless from our first contact to unlocking the door to paradise. We will stay here again on our next trip to Maui. Mahalo Scott for your kind words. I appreciate your review and are so happy that you enjoyed your time in Maalaea. I feel that it is a very special place. Beautiful condo, but no good third bed option. Overall, we enjoyed our two night stay at this condo. The biggest drawback was that there was not a reasonable third bed option. In addition to the king bed, there was a pad for a third person to sleep on, but using that alone would basically be sleeping on the floor. We didn't try the air mattress since other reviews said it leaked throughout the night, and slept on the couch (not very comfortable). Laundry: not in-unit or free. Also were specified to leave only two loads of laundry, but it was unclear if that was in addition to sheets and how much one load would consist of. TLDR: Great place for two people to stay for a quiet vacation, not ideal for parties of three, or people looking for an active area. Thank you Bethany for the review. It is always helpful to us as owner to know what you enjoyed and what you did not. I went back through our conversation, I was clear that there was not an air mattress in the unit and it was a single fold out futon in the closet. That is what is used in many units for an additional person in a small condo. I do not advertise as a beach front or in laundry unit. You are not asked to do the laundry so I am not sure where you saw 2 loads of laundry, but we just ask you to strip the beds and take out the trash before you leave the unit. I did not know about the door jam until 2 weeks after your departure. It is always helpful if I know when there is a problem so it can be fixed immediately. I appreciate you taking the time to write such a detailed review, but I also want to be very clear that the drawbacks you write about are not things that were falsely advertised. The Maalaea area is a quiet area which many people enjoy. We have rented our condo for over 30 years and have many return guests. Overall we had a great trip. The view from the balcony is awesome. The kitchen was nicely remodeled and had everything we needed. The complex also had some nice bbqs. The only things that need improvement are the bed was not that comfortable and the sliding glass door is really finicky and difficult to open and close. It probably needs to be replaced. We visited the aquarium and some restaurants that were walking distance, so that was convenient. If you’re unfamiliar with this part of Maui. It does seem to be pretty windy at times. The unit does not have ac but this was not a problem for us, with the breeze and ceiling fans we were able to cool it. Although a couple of nights it was so windy outside it was difficult to sleep. Thank you for the review. We were actually there part of your stay and tried to say hello but car was not there. I am sorry to hear about the bed as it was replaced 5 years ago. Thanks for the update on the door. We will look into that. Hope you enjoyed all Maui has to offer. We will Côme back as usual. We rent the month october year. Se Dawn and Dean for détails. Cleaning fee of $125.00 Taxes of .1441% on each stay for GET and Transient Tax Cancellation fee of $100 plus Homeway fees prior to final payment....... after final payment, there are no refunds unless we can rent the unit.